Lynne's Favorites for improving your life! Create and live your dream life! This was recent game changer in my life! I am proud to say that I learned how to manifest my dream HOUSE! Denise's books and classes come with support! I have met women from all over the world who also learned that decluttering their lives will bring in what they want...whether it is money, love, weight loss or forgiving their mothers. Everyone is very positive and outgoing EVEN if they are going through challenging situations like divorce, abuse or extreme health challenges. We know we can be apart of the solutions! You can start today and be so happy tomorrow! Spice up your life the healthy way! Wildtree is my favorite recommendation for you to learn how to source and prepare organic, flavorful, healthy, delicious meals. Don't know where to start? We have spice blends, sauces and ingredients to make it so EASY whether you want to have Asian, Italian, comfort, kid-friendly or fine foods- we have you covered! We offer in-home or office workshops to learn how to stock your freezer which saves time and money. You can eat healthy versions your favorite foods whether you are cooking fresh or preparing a head of time! Live for a clean happy life! 20 years ago I used one Chinese Essential Oil called White Flower that I loved for aches, pains and headaches. Today, I use Essential Oils for anxiety, digestion, cold prevention, infection and so much more! I use them for cooking, cleaning my house, diffusing aromatically and even for my pets! While I have used oils from many companies over the years I am ecstatic with the excellent therapeutic quality, ease of ordering and competitive pricing. I can't tell you how much these oils have improved my health and wellbeing for me and family! 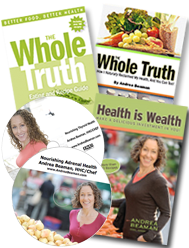 Featured Books and 101+ Secrets from Nutrition School!!! Why Can't You Just Eat?